Woodhouse vented her frustration with the ongoing Depression by running for political office. In 1940, the Connecticut Democratic Party convinced an initially reluctant Woodhouse to join the ticket.4 By a larger margin than any other elected official in the state, she won a two–year term as secretary of state.5 From 1943 to 1948, Woodhouse presided over the Connecticut Federation of Democratic Women's Clubs. She served on key wartime labor boards in Connecticut, the Minimum Wage Board and the War Labor Board, chairing the latter.6 From 1942 to 1943, she also chaired the New London Democratic Town Committee. Woodhouse later recalled that her desire for social change and economic justice for women convinced her to run for a seat in the U.S. Congress in 1944. Though she first was interested in a U.S. Senate seat, the Connecticut Democratic Party instead nominated her as a Representative.7 At the state convention, Woodhouse defeated William L. Citron, a former Congressman At–Large, by a vote of 127 to 113 among party officials.8 She earned a reputation as an indefatigable campaigner and talented public speaker, supported by an active network of labor and women's organizations. In the general election Woodhouse faced one–term GOP incumbent John D. McWilliams, a Norwich builder and town selectman. She described the central campaign issue as the development of a postwar United Nations and international redevelopment system "that will make permanent peace possible." Woodhouse also advocated tax reform, a plan for full peacetime employment, and more federal money for education and rural electrification programs.9 In the 1944 elections, voter turnout was high and President Franklin D. Roosevelt carried the state by a slim margin of 52 percent. Woodhouse ran even with the President, edging out McWilliams with a plurality of about 3,000 votes. Her male House counterparts, Woodhouse recalled years later, made her feel more a colleague than part of a distinct minority. Speaker Sam Rayburn of Texas steered Woodhouse onto the Committee on Banking and Currency, an influential assignment for a freshman Member and one he thought would best put her talents to use. Woodhouse's daughter, Margaret, then in her early 20s, worked in the Washington office as executive secretary.10 Woodhouse also was innovative in that her chief political adviser, John Dempsey, was based in the district rather than in Washington, D.C. He eventually became a powerful Connecticut governor and one of the state's longest serving chief executives. In her first term, Woodhouse fought for the maintenance of wartime price controls as a protection against inflation for consumers and for more affordable housing for returning veterans. "I have no illusions of what a new Member of Congress can do the first year," she told reporters. "I'm going to evaluate every piece of legislation in terms of how many jobs there will be after the war. Feed them first and reform them later!" The Harry S. Truman administration failed to heed her warnings on the issue and rolled back price controls. Standing for re–election to the 80th Congress (1947–1949) in 1946, Woodhouse and other Democrats faced serious challenges at the polls. Unemployment problems created by rapid demobilization, as well as soaring prices for groceries and other staples, roiled voters. Her opponent in the general election was Horace Seely–Brown, a World War II Navy veteran who married into a family that operated a lucrative apple orchard in eastern Connecticut.13 Disaffected Democratic voters did not turn against so much as they simply stayed at home in large droves. Seely–Brown captured about 60,000 votes, roughly the same number as McWilliams had in 1944. But Woodhouse polled nearly 15,000 fewer votes than in the prior election, as her opponent won with a comfortable 55 to 45 percent margin. Backlash against Democrats was further aided by the presence of voting machines, which allowed for voting a straight party ticket with the push of a single button. Republicans swept all five Connecticut House seats, turning three Democratic incumbents out of office. 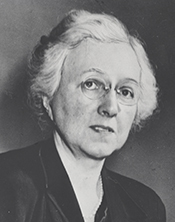 After Congress, Woodhouse served as head of congressional relations for the Office of Price Stabilization, where she worked from 1951 until 1953. She was an early and harsh critic of McCarthyite anti–communism, especially when used for political gain.22 From 1953 until she retired in 1980 at age 90, Woodhouse served as head of the Connecticut Service Bureau for Women's Organizations in Hartford. Woodhouse also was the first chair of the Connecticut Committee on the Status of Women and was a delegate to the Connecticut constitutional convention in 1965. She retired to a circa–1726 home on a 390–acre farm near Baltic, Connecticut. On December 12, 1984, Chase Woodhouse died in New Canaan, Connecticut. 1Current Biography, 1945 (New York: H.W. Wilson and Company, 1945): 690–692. 2Andree Brooks, "A Pioneer Feminist Savors Grandmother Role," 10 May 1981, New York Times: CT 1. 3Current Biography, 1945: 691; see, for example, Marjorie Shuler, "University Women to Review Rights and Duty in New Fields," 30 March 1927, Christian Science Monitor: 3.; Jessie Ash Arndt, "Mrs. Woodhouse Tells of Studies in Trends," 21 May 1940, Washington Post: 13. 4Chase Going Woodhouse, Oral History Interview, U.S. Association of Former Members of Congress (hereinafter cited as USAFMOC), Manuscript Room, Library of Congress, Washington, DC: 161–165. 5"Connecticut Woman Seeks U.S. Senate Seat," 22 July 1944, Christian Science Monitor: 5. 6Susan Tolchin, Women in Congress (Washington, D.C.: Government Printing Office, 1976): 83. 7"Connecticut Women Back Mrs. Woodhouse for Democratic Nominee Against Danaher," 12 June 1944, New York Times: 11; "Connecticut Woman Seeks U.S. Senate Seat," 22 July 1944, Christian Science Monitor: 5. 8"Mrs. Woodhouse in Race," 13 August 1944, New York Times: 34. 10"Daughter Serves Mother," 27 July 1950, Christian Science Monitor: 5; a stand–alone photo and caption. See Woodhouse's extensive recollections about Margaret in her Oral History Interview, USAFMOC. 11Congressional Record, House, 79th Cong., 2nd sess. (12 July 1946): 8861–8864; quote on 8861. 12Congressional Record, House, 79th Cong., 1st sess. (5 June 1945): 5584. 13Woodhouse, Oral History Interview, USAFMOC: 203–205. 14"Democrats Give Post to Mrs. Woodhouse," 15 February 1947, New York Times: 3; "Political Apathy Decried by Women," 17 April 1948, Washington Post: B4; see also, "Mrs. Woodhouse Off on Democratic Tour of 17 States With a Gibe at Mrs. Taft," 3 October 1947, New York Times: 4. 15Woodhouse, Oral History Interview, USAFMOC: 261–262. 17"Election Statistics, 1920 to Present," http://clerk.house.gov/member_info/electionInfo/index.aspx. 19Alexander R. George, "Hoover Reorganization Plans No. 1 on Lady Legislators' Lists," 3 July 1949, Washington Post: S4. 20"Rep. Woodhouse Finds Berlin Lift a Bargain," 4 March 1949, Washington Post: C5. 21"Election Statistics, 1920 to Present," http://clerk.house.gov/member_info/electionInfo/index.aspx. 22"Smear Campaigns Laid to ‘Traitors,'" 19 November 1950, New York Times: 38. Papers: 1922-1984, 50 linear feet. The papers of Chase Going Woodhouse reflect her activities and interests in women and family issues, service to the state of Connecticut and her local community, and other career activities (excluding her duties as secretary of state and U.S. representative). Included are published and unpublished writings; office files, scrapbooks, and annual reports of Auerbach Service Bureau, a women's service organization, Hartford, Conn.; reference files and reports of U.S. Work Projects Administration, Trends in Occupations Project; reference files, newsletters, and reports on the status of women and the women's movement; records of Connecticut Constitutional Convention (1965) to which she was a delegate; Juvenile Justice Standards Project records and publications; and citations, commissions, awards, and photos. A finding aid is available in the repository and online: http://www.lib.uconn.edu/online/research/speclib/ASC/findaids/Woodhouse/MSS19830009.html. A finding aid also is available through the National Inventory of Documentary Sources in the United States, microfiche 3.78. Papers: In the Political Women in Connecticut Collection, ca. 1934-1981, 5 linear feet. The collection includes photocopies of transcripts of oral history tapes held by University of Connecticut, Center for Oral History, Storrs, Conn. Interviewees include Chase Going Woodhouse. A finding aid is available in the National Inventory of Documentary Sources in the United States, microfiche 3.78.35. Papers: In the Douglas M. Fellows Papers, 1955-1972, 480 items. Correspondents include Chase Going Woodhouse. Oral History: 3 folders. Transcript in the Oral History Collection of the Association of Former Members of Congress. Restricted. Sound recording in the Library's Motion Picture, Broadcasting and Recorded Sound Division. Papers: In the Florence Ledyard Cross Kitchelt Papers, 1885-1961, 4.75 linear feet. Subjects covered include Chase Going Woodhouse. The Florence Kitchelt's journals are available on microfilm. Microfilmed originals are closed; use microfilm. An unpublished finding aid is available in the repository. Papers: In the Helen Brewster Owens Papers, 4.25 linear feet. Subjects covered include Chase Going Woodhouse. The collection has been published on microfilm. "Chase Going Woodhouse" in Women in Congress, 1917-2006. Prepared under the direction of the Committee on House Administration by the Office of History & Preservation, U.S. House of Representatives. Washington: Government Printing Office, 2006. Woodhouse, Chase Going. The Big Store: Opportunities in Department Store Work. New York: London, Funk & Wagnalls,1943. ___. Comparison of Schedule and Account Methods of Collecting Data on Family Living. Washington: N.p., 1933. ___. Dental Careers: Opportunities in Dentistry and Dental Hygiene. New York: London, Funk & Wagnalls,1939. Woodhouse, Chase Going, ed. After College- What? : A Study of 6665 Land-Grant College Women, Their Occupations, Earnings, Families and Some Undergraduate and Vocational Problems. Greensboro: North Carolina College for Women, 1932. Woodhouse, Chase Going, and Edward James Woodhouse. Italy and the Jugoslavs. Boston: R. G. Badger, 1920. Woodhouse, Chase Going and Ruth Francis Yeomans Schiffman. Dentistry, Its Professional Opportunities: With Chapters on the Dental Hygienist, Dental Assistant and Dental Mechanic. Greensboro: The Woman's College of the University of North Carolina, 1934. Woodhouse, Chase Going and Ruth Francis Yeomans Schiffman. Occupations for College Women, A Bibliography. Greensboro: The North Carolina College for Women, 1929.